1. Jr. Hamburger with Mandarin Oranges. With 480 milligrams of sodium, the Jr. Hamburger is the only sandwich that meets our low-sodium requirements. Pair this with some mandarin oranges for a calorie total of just 320! 2. Sour Cream and Chives Potato with 5-piece Crispy Chicken Nuggets. This entire meal is pretty filling and although it comes in at just slightly more than 500 calories, it’s still a pretty good meal choice in the sodium department with 480 milligrams. 3. Garden Side Salad. When you order this with fat-free French dressing, you get a sizable vegetable salad with just 220 calories and 400 milligrams of sodium. Add a small handful of unsalted almonds from home to make this meal more filling and nutritious. 4. Baked Sweet Potato with 1/2 Small Chili. This is a powerhouse of a meal and will make a serious lunch or dinner. The sweet potato is baked in house and has no other ingredients (tell them to skip the cinnamon butter spread). Order a small chili and only top your potato with half of it. That’s 365 calories and 540 milligrams of sodium that’s loaded with protein and fiber that will keep you full. 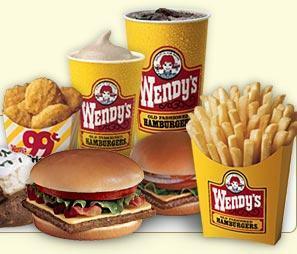 What’s your favorite healthy menu item at Wendy’s? A certified personal trainer with a masters in health journalism, Jenn's approach to fitness and health is balanced, fresh, and fun. She's run multiple half marathons (one full!) and seeks solace in 90s pop music.